Most of our posts are of our couples’ weddings because we love sharing their big day with you! But lately I’ve seen so many brides-to-be on different social media groups asking for advice involving their e-shoots so I thought I’d share some tips for how to prepare for your engagement session! First things first, check out Part One of this Series: What to Wear and How to Prepare. This place is gorgeous! It looks like it shouldn’t exist near Houston. 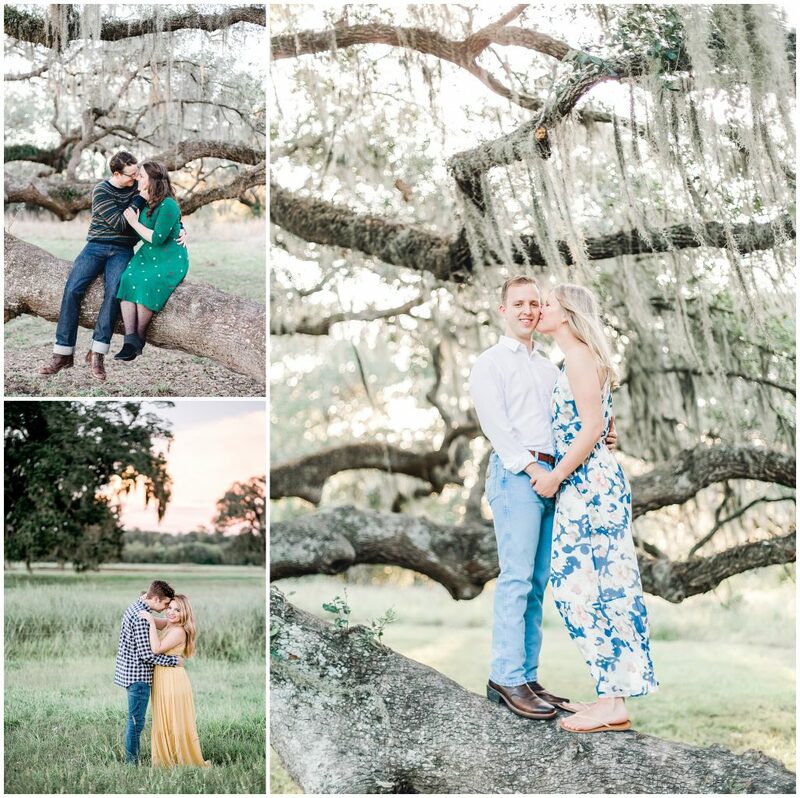 There are endless fields of tall grass and giant live oaks with hanging moss that are fun to shoot through, creating dreamy images with blurry foregrounds. There’s no permit required, only a $7 per car entry fee. This is a great option for shy couples because it’s usually pretty secluded. You won’t have crowds of people staring at you or bystanders in the backgrounds. ***side note about this spot. They currently allow photographers to shoot here without a permit, but that will quickly change if tons of folks start disturbing the area and being disrespectful. In fact, many of my fellow colleagues didn’t want me to put this one on here, for fear others would discover their secret location. Please remember, Leave No Trace, don’t use colored smoke bombs, confetti, or leave behind trash or props. All it takes is one bad apple to ruin this spot and get photographers permanently banned. This is a good option for couples who really love Houston but also want a bit of nature. It has both! From certain vantage points you can capture Houston’s skyscrapers in the background, but there are tons of little nooks that we can shoot in to make it look more like you’re in a true park. The scenery is constantly changing with the seasons. Just a block away is Sabine Bridge, which is a great place for sunset photos. There’s no permit required, though Buffalo Bayou Park does require one. I think spring and fall are the best times to shoot here. I sort of have a love-hate relationship with Hermann Park, but I’ll give you all the details anyway. Pros: It can be very beautiful, especially during the spring, and it’s a convenient location for most Houstonians. They typically don’t enforce permit requirements, but if your photographer uses a flash set up, they might. But it’s often so crowded here, that it’s not always the best option for our shyer couples, who may be uncomfortable with strangers staring at them. And there are going to be people in your backgrounds. Located near Hermann Park are McGovern Centennial Gardens and the Japanese Gardens, so I’ll lump them both into one. BOTH locations are beautiful but both require a hefty permit (one is $135 and the other is $150). I have had couples select Hermann park and then we pop into McGovern or the Japanese Gardens, but we have about a 65% chance of the attendant asking us to leave if we can’t supply our permit. Both are beautiful, especially in the spring. Most of these example images were shot in the areas that require permits. Check the sunset time for the date you are interested in and make sure it’s the park will be open a full hour before. If you’re not sure, just email Amy! One location, tons of options! Downtown Galveston has an old world vibe that, in some ways reminds me of my hometown of Macon, Gaeorgia or possibly a little of New Orleans. There are a lot of cool spots to shoot at. And just minutes away are the beach, the pier, and Pleasure Pier amusement park. A two hour engagement session could EASILY fit in each location. Choose Pleasure Pier if you’re a young, fun-loving couple that wants photos playing carnival games and smooching on the Ferris Wheel. There are entry fees for the Pleasure Pier park, but there’s no permit required for any of our Galveston spots. I love shooting under the pier and on the rock jetties. Just on the other side of the island is East Beach, which has more of a nature vibe, and less tourists. 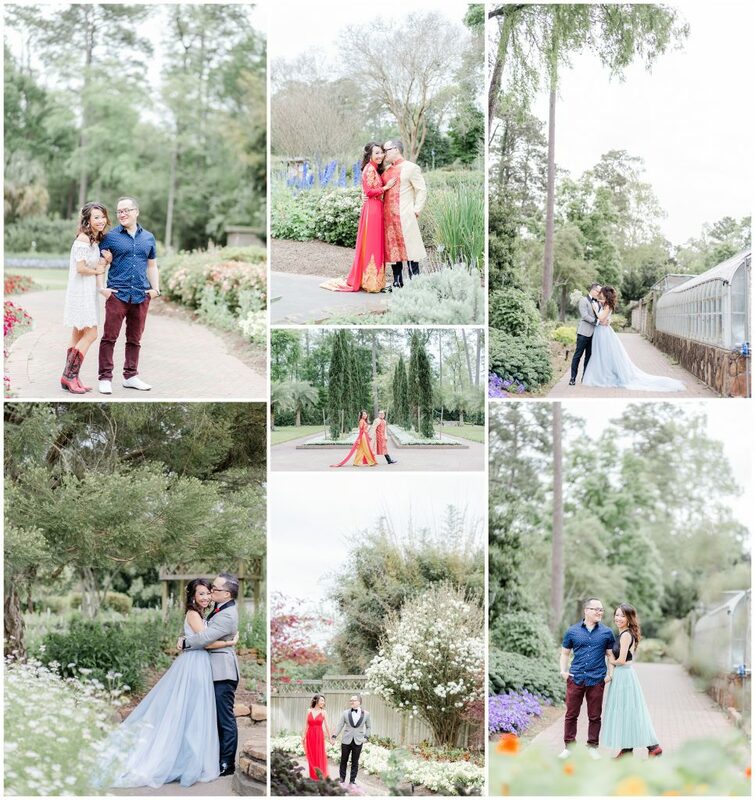 Not to be confused with the Mercer Arboretum & Botanical Gardens, the Houston arboretum is often a favorite spot because many of our couples have a connection to it. Some even had their first date here! While we can get some fun images here, it’s not my particular favorite because the light isn’t as good. You guys all know how I feel about light and why it’s so important to the bright and romantic style of photography. In order for you to have god light, nice smooth skin, and bright images, your face needs access to light, usually the open sky. But when you are completely surrounded by tall trees that block that light, often you’ll have dark shadows under your eyes and nose, and the green from the trees will reflect back onto your skin. If you want bright images, this location may not be for you. The thing about photography is, flat is often boring. Great images have depth and texture. Well Houston is probably one of the flattest places on earth, so we are always open for a drive to an epic location! Chappel Hill Lavender Farm is one of our go-to spots. While it is about 2 hours away, it’s a great spot for photographs because it’s in hill country. We have a special relationship with the owners and they don’t require you to pay a permit or even an entry fee. The lavender blooms in the summer but it’s gorgeous in that whole area year round. Several of the sessions we’ve shot here have been picked up by bridal magazines and wedding style blogs. A great option is to start here and then drive around the area and get different farms and landscapes. If you want a more urban vibe to your engagement session, you’re in the right place. Houston has some pretty cool spots. Some of my favorites are a parking garage in the Theater district, the Saks Parking Garage, Discovery Green (requires an inexpensive permit) Smithers Park, the Orange Show, the Graffiti Wall, as well as some college campuses, bars, and coffee shops. When considering indoor locations, it is SUPER important that the area have LOTS and LOTS of natural light, such as from a window (not overhead light or lamplight). Once place I’ve heard about is the Museum of Art, and its rooftop patio. I haven’t shot there, but I’d be excited to check it out. Lots of other photographers may suggest the WaterWall, but I, personally, don’t think that’s the best place for an e-shoot. First, it’s almost always crowded and everyone wants the exact same photo- a wide shot in the front and center of the wall. But that area requires a permit and last I heard it was a whopping $250. You might get away with not paying one, but the last thing I’d want to do is plan on shooting there, show up to see there’s a huge crowd, or get kicked out and fined. If it’s up to me, I’d rather we find beautiful locations and get photographs that tell your love story, not replicate a shot that 500 other people have. 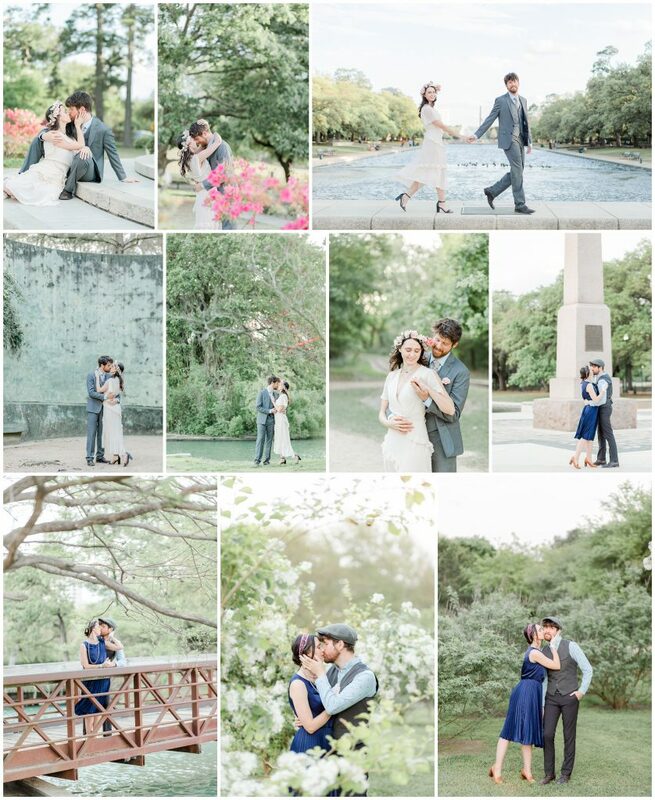 Here are some examples of images shot in downtown Houston. Pedernales is my new favorite spot because it’s perfect for photos. The light is amazing on both sunny and overcast days, it’s large and open, and the light colored stone is the prefect natural reflector so your skin looks like buttah. There are so many areas to shoot, both down next to the spring-fed river and higher up at the scenic overlook. Also crowds aren’t really an issue. Hamilton Pools is located near Austin and is a great option for those who want something different than your cookie-cutter park setting. It can be crowded and they close at 5:30, so it’s only a good option in the winter, when the sun sets earlier, or on overcast days. But because it’s in hill country you can also drive around the nearby area and pull off at scenic overlooks. Enchanted Rock is one of the most beautiful places I’ve ever seen. It’s located near San Antonio, so there’s a bit of a drive. But if you want an epic location and images that will have all your friends and family going ga-ga over, then this is your spot! Enchanted Rock is one part granite mountain, one part desert, and has gorgeous sunsets. Every session we’ve shot here has been published by bridal magazines and style blogs. If you’re up for a road trip, so are we! Lastly, if you’re looking for an indoor location for your bridal portraits (or the PERFECT space for boudoir) I HIGHLY recommend the Oak Atelier. It has amazing, soft light, gorgeous furniture that you can sit and lounge on, and light brick white walls that help give your bridals a light and airy feel. It’s my favorite indoor location in Houston. Doing your bridals indoors means that you don’t have to worry about getting your dress damaged before your big day. These are just a few of the many locations in this area! We are always open to shooting in new spots, so if you have a suggestion, we’re all ears!